If you live in an apartment or a condominium in Dallas, you must have access to recycling. That’s the law, after Dallas City Council voted unanimously Wednesday to require all multi-family complexes to provide recycling by 2020. Dallas is scrambling to catch up with the city of Fort Worth, which began mandating apartment recycling in 2014. Recycling advocates praised the decision and say they want to see similar recycling standards for businesses and development projects. The ordinance requires all multi-family property owners to provide an on-site recycling program that includes education and accessibility for residents by January 1, 2020. It also requires that recycling companies that service these properties register with the city and report the amount of materials processed at recycling facilities. City officials say this is one of several policy measures that is outlined in the city’s 2013 Zero Waste Plan, also known as the Local Solid Waste Management Plan 2011-2060. The plan aims to reduce waste generation and landfill disposal by up to 85 percent by 2040. Recent data shows that more than half of Dallas residents live in multi-family properties, and less than a quarter of those properties have recycling programs. Diane Tasian, a Dallas condo resident and representative with the League of Women Voters Dallas Chapter, said she had to lobby her property managers to provide a convenient recycling program at The Warrington in Uptown. 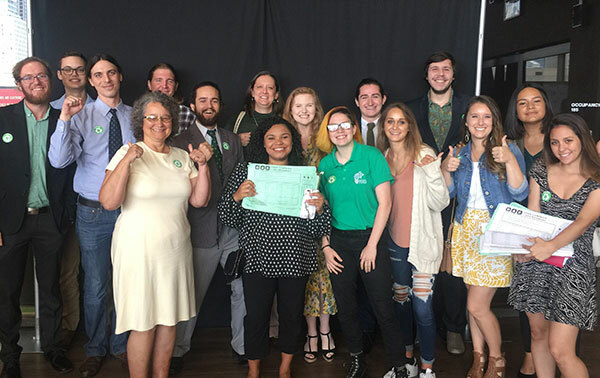 Advocates with Texas Campaign for the Environment have sparred with the Apartment Association of Greater Dallas over the need for a policy mandate for years. Advocates say the trade association and city leaders previously resisted anything but voluntary compliance with multi-family recycling programs as far back as 2003. 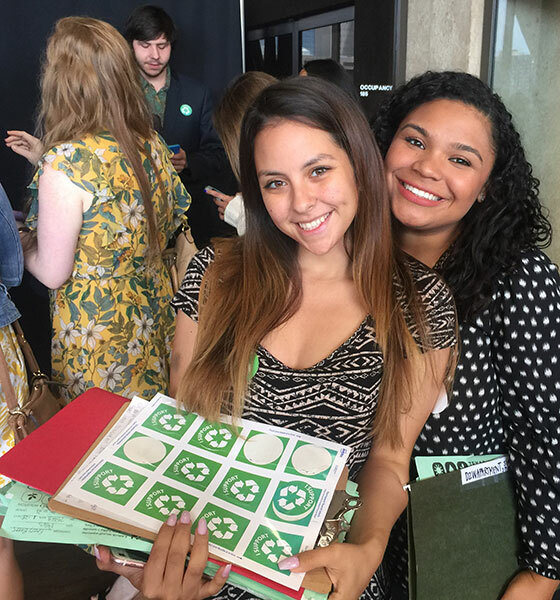 Texas Campaign for the Environment canvassers, like Yadira Munoz and Hunter Gay, pictured, collected thousands of letters of support for recycling. Troiani said its members and supporters have written more than 12,000 letters to city officials on waste diversion programs. They have plans to continue organizing support for recycling and composting services in Dallas – including recycling programs for office buildings and other businesses, and changes to the city’s monthly bulk and brush program that would keep brush and leaves out of the landfill – later this year.